This book combines a bit of magic, romance, holiday traditions, and fantasy in a whimsical adventure. 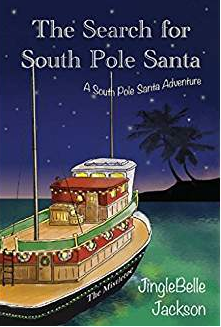 There are two main plots: Sandra’s story detailing her life on a tugboat named Mistletoe moored on an island in the South Pacific, and the contest Santa Claus decides to hold to find a second Santa to cope with the world’s exploding population of children. Sandra’s parents are missing and presumed dead. They had recently enrolled her in the St. Annalise Academy where the students are all gifted, whether they be human or part supernatural. Throughout the story, Sandra learns more about her lineage and special talents. At the same time, readers are introduced to her new friends. When Sandra learns about the contest for a second Santa, she immediately applies. Cappie, her guardian, and her island friends encourage her. Readers are taken on a colorful journey to the North Pole, where they participate in the fun-filled but grueling competition to determine the winner. There are lots of twists and turns, holiday magic and fun, mixed in with a bit of romance and coming of age in both parallel plots. In the end, what will Sandra’s future hold? Will she learn how to cope with the loss of her parents, her talented friends, and the boy who seems to disdain her? Who will win the Santa competition? Stay tuned for more answers in the next book of the series. This book was a fun read. It is highly recommended for middle grade and young teen readers. Adults looking for a light holiday read will also enjoy if willing to suspend reality for a few hours. Interested in receiving our Quest Teaching newsletter with helpful teaching tips,teacher tools and more?